A funny thing is happening to me on Pinterest. I’m not a big pinner, but I have a few boards. For some reason, my Organizing board now has over 300 followers, and more follow every day. This is very surprising to me. I’ve never thought of myself as any kind of guru on organization. Except wait—maybe I am, kind of. I’ve come a long way in terms of organization. I used to be a real slob. I used to never ever have my act together. I used to lose my keys EVERY SINGLE DAY. My family will testify to all of the aforementioned. Just like the best weight loss advice comes formerly fat people, l suppose the best person to give organizing advice is a reformed slob, right? So, without further ado, here are my super-basic tips for getting and staying organized. Have less stuff. Most of us don’t need more storage, we need less stuff. So purge! Getting rid of stuff you don’t love or use makes it easier to enjoy the stuff you do. 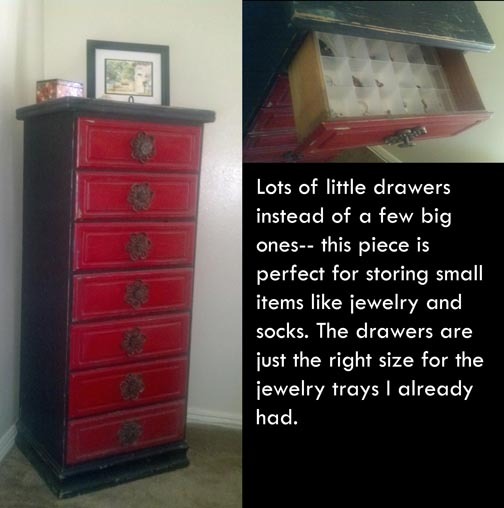 Before you buy something new, try to imagine where you’ll store it and how often you’ll use it. Do you have a place for it? And is it worth the space? Think about that potential purchase sitting on a closet shelf, with all the other crap you thought you needed. Think about selling it at a garage sale in a couple years—for a dollar. That kind of visualizing really helps me buy less stuff. The less stuff I bring home, the less I have to organize. A place for everything, and everything in its place. That expression has been around for almost 200 years. (http://en.wikipedia.org/wiki/Charles_A._Goodrich) You can’t put things away if you haven’t established where they go. And you can’t keep everything on the counter or table or floor. Your belongings need a real home, where they are out of the way when you’re not using them. Clear surfaces make your home much more peaceful. Read Organizing from the Inside Out, by Julia Morgenstern. This book was life-changing for me. The gist is to organize according to your natural tendencies, not someone else’s prescribed system. Julia offers a simple method to make your surroundings and your systems fit the way you live. I still mentally refer to it whenever I set up or reorganize a space. Best organizing book ever. Just do a little tiny bit. I am easily overwhelmed, and when I’m overwhelmed, I do nothing. So when the housework is piled up or I have a nasty organizing job, like the craft room or the garage, the trick is to not let it overwhelm me. I tell myself that I will just clean one counter. Or empty one box. Or, I will set the timer and tell myself I just have to work on it for 20 minutes. I can stop when I’m done with just that little bit…but I almost never do. Progress begets progress. When you complete one small task, you feel motivated to continue. Make it pretty. If I buy a $3 bouquet of flowers, it will prompt me to clean my whole kitchen, because I can’t stand to put something pretty in the middle of a mess. Likewise, if I enjoy my space aesthetically, I’m more likely to honor it by sticking to my organizational systems and keeping it tidy. I found this cute dresser in my favorite antique store. I use it for all the small stuff– jewelry, socks, scarves– and it’s so pretty, I don’t want to mess it up– so I keep it neat! Throw a party. Seriously. As a procrastinator, I find a deadline immensely helpful. I also have a healthy sense of shame* about my shoddy housekeeping tendencies. So if people are coming over on Saturday, then that paper pile-up on the dining table has to be gone, and the floors have to be cleaned- by Saturday. Otherwise, there’s no reason I can’t leave it messy for another week. Entertaining helps keep me on my toes. It doesn’t have to be a party, just a dinner guest will do—any new set of eyes around my house does the trick. *Most shame is not healthy, of course. Your house doesn’t have to be perfect before you have someone over. And you don’t have to scrub your shower or re-organize your garage before you have a dinner guest. Use this trick only to the degree that it’s helpful. These days, my house still gets messy, but it’s definitely functional. Everything has a place and the places make sense to me. And you know what? That’s all it means to be organized: my home works for me. 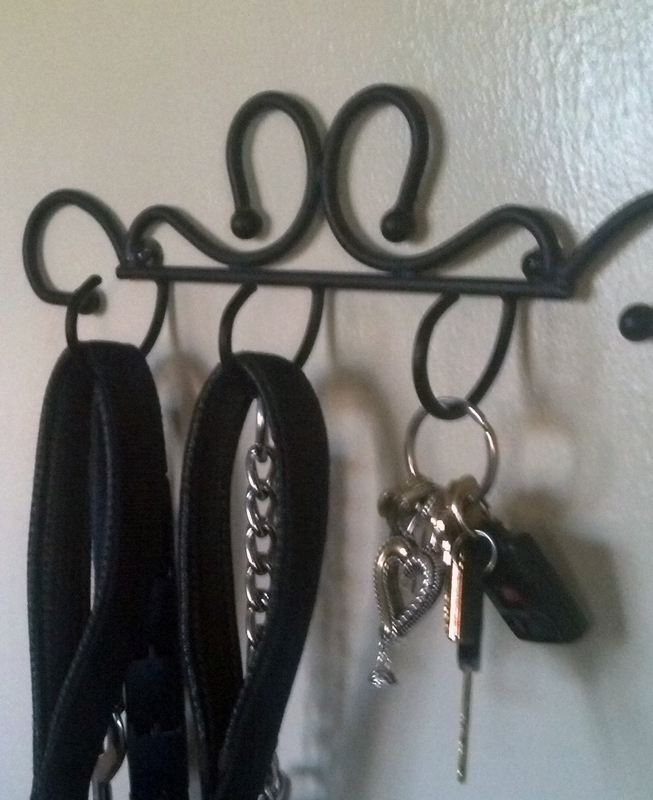 There is a functional order to my belongings and I enjoy being in my home. I win. This entry was posted in DIY, Motivation/ Self-help, Uncategorized and tagged cleaning, housekeeping, organization by midlifemeg. Bookmark the permalink. Yes! That’s where I want to be! That’s the most important standard as far as I’m concerned. Good luck. Seriously, if you want a great book on staying organized, try Julia Morganstern’s. Totally helped me. Thank you for the recommendation. I’ll have to get that.